Hey everybody, and welcome back. I know it's Sunday night and we're all dreading Monday, so I figured I'd send you off with a "good feel" story. Anyone from the tri-state area, or a general basketball fan knows well and true that the New York Knicks have been awful for quite some time. Ranging from off floor distractions like Stephon Marbury, to lost hopes in the departure of David Lee, Knick fans have had to accept failure despite one of the larger pay rolls in the NBA. Could this wave of anguishing failure be over? Seemingly so, now that coach Mike and his boy Amar'e are reunited all problems have vanished in a New York minute. With Stoudemire averaging nearly 25 points and 9 boards a game, spirits are high during this holiday season for more than one substantial reason. True, it has been almost 40 years since the Knickerbockers of old have found themselves in the winners circle, and fans probably have every right to be skeptical (hear me out), but this could be the real deal folks. The team is 9-1 as of today in their last ten games, and quite personally I can't recall the last occurrence of this feat. True, it is early and things could change quickly, but if everyone stays healthy we've got a contender on our hands. New York is the biggest city in the world, with the greatest fans; now they truly have a basketball team to be excited about. Keep an eye on them, title 3 and conference championship 9 could be on the horizon. 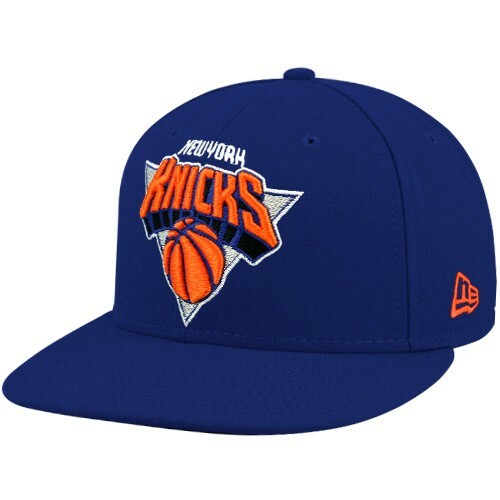 The cap shown has a blue brim and crown with the classic Knicks primary logo front and center. You can pick yours up, and other merch like it at the link below. Hope I was able to lighten up your Monday, remember only 19 days 'til Christmas!